I took a road trip down to St. Louis. It's an easy 3-1/2 hours from the southern suburbs of Chicago. It was more of an oasis or pit stop on our way to the middle of Kansas to pick up my sister's new little puppy. 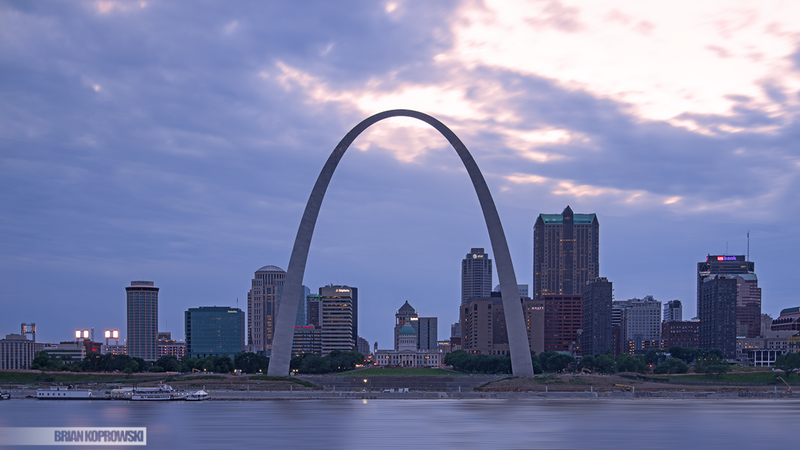 Nonetheless, we had a night in St. Louis so I decided to go out and shoot the skyline. I first decided that I wanted a view of the skyline from across the river on the Illinois side of the Mississippi. 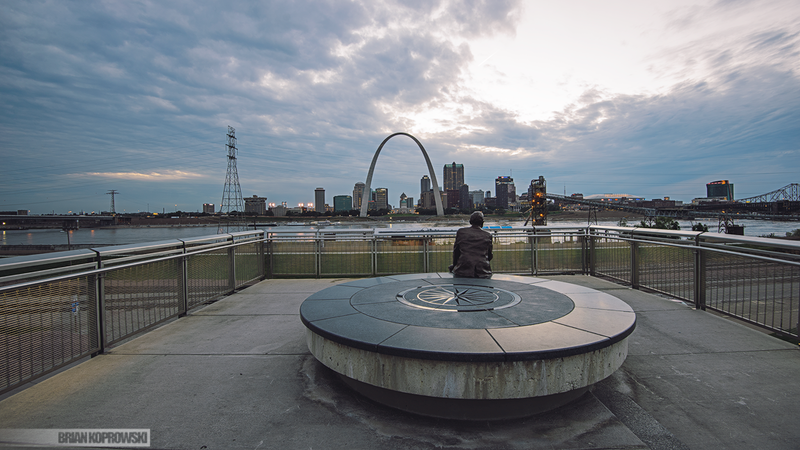 So, I cross the Eads Bridge to East St. Louis and find the Malcolm Martin Memorial Park. It's right next to Cargill (a food distribution service that uses barges as transport along the Mississippi) and Casino Queen. I googled areas to photograph in St. Louis, around St. Louis, and this spot kept popping up. Here's the thing: The idea behind this vantage point is awesome. I wish Chicago had one of these look-out towers/platforms in some of their locations. The park is very clean and open. But, the view is obstructed by telephone wires and Cargill's loading platform. I mean, these wires and platforms really take up much of the skyline view. That's why, in my opinion, this spot was empty. I know East St. Louis has a bad rap, but if this vantage point tower wasn't giving off obstructed views of the skyline this park would be bumpin' with tourists and locals alike. I know I'd see more photographers for sure. But, hey I give them an A+ for the idea and effort. 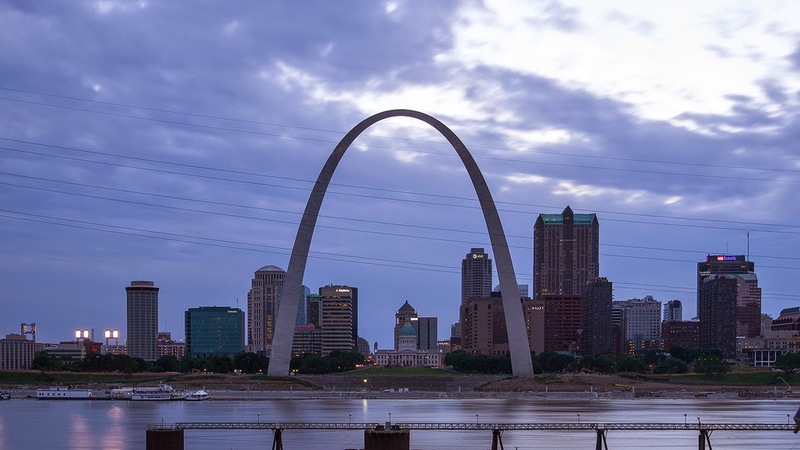 Also, the Gateway Arch park and riverfront were under siege with construction, but I feel that it's going to look way better than the riverfront used to look. I am posting the image with obstructed views and one that I cleaned up. I'm not really excited about either of the images, but figured I'd share the view just so you know what it is I'm explaining.